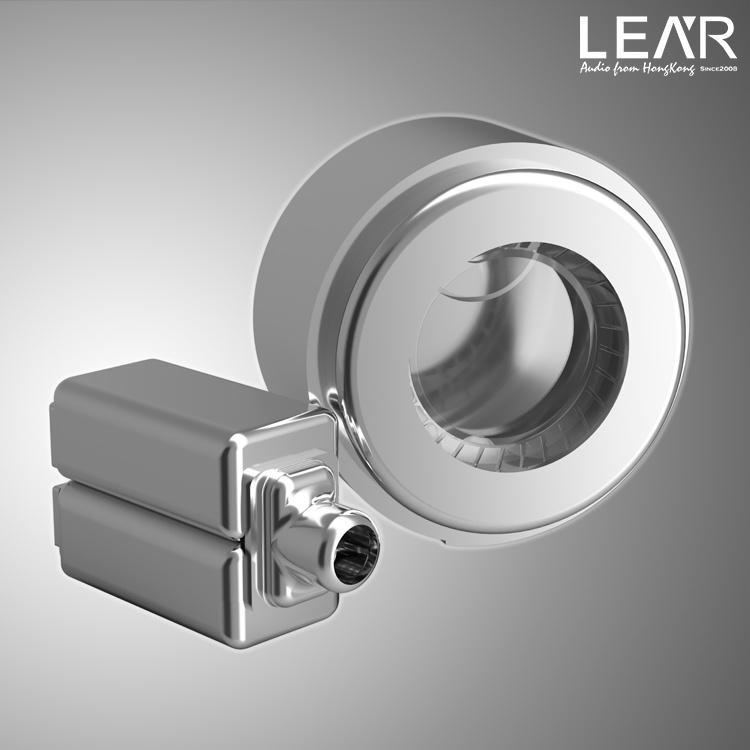 I saw the LEAR Kaleido and was attracted to it instantly. It was like a smexy blue black unicorn mixed with My Little Pony and sparkles. Certainly not garish in a way If there had been simple glitter involved but as you can see the colorful highlights are rough flakes and chunky bits of reflective glory encased in smooth acrylic. The blue black nicely serving to offset and enhance the colorfulness and providing an excellent juxtaposition. 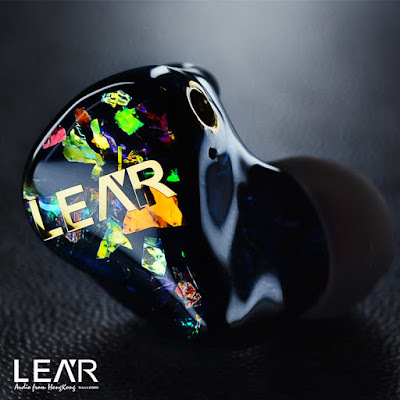 The LEAR Kaleido has a smooth approach, with mids that are soft and rolling, treble that is very forgiving with a bit of low end sub bass rumble in the jungle. Its not the usual 2BA one DD V shape that has become all so predictable these days. The Kaleido is a new look to a common configuration that is lush and fatigue free. `The LEAR Kaleido features a specially-adjusted hybrid system of 2 balanced armature drivers combined with a ⌀7mm dynamic driver . The design includes a precisely calculated three-way electronic crossover with acoustic low-pass filter, which smoothly integrates the output of both the balanced driver and dynamic speaker . In this system,the dual balanced armature drivers can handle medium to high frequencies with ease, and the dedicated 7mm dynamic driver which made with pure copper coil , neodymium magnet and high-quality PET diaphragm offers a powerful bass result! The addition of a rich bass to the smooth, natural-sounding medium and high frequencies means that the lowest, deepest tones are perfectly in balance with the precision and high quality of higher ones, a result that pure dynamic earphones are very difficult to achieve. It creates a feeling of fullness, with an elastic bass range that allows listeners to enjoy strong, dynamic genres of music while simultaneously benefiting from the addition of balanced armature drivers. and a soft rubber inside to protect your earphones. and MMCX connectors to a SE 3.5mm. *Other cables I have seen are white/translucent and I am informed that they are the same. Soldering with Hi-Fi grade 4% silver solder. I found it hard to capture the true look of the Kaleido with my pitiful photography skills, but as you can see from the earlier stock picture the results is glamorous and stunning. Acrylic and lightweight they slip easily into ones outer ear, fit should be easy for most as they are of a small to medium size. They are silky smooth and I experienced no irritation. The shells as well as the nozzles are the smaller side of things. I ended up using the stock tips for this review as shown below. As regular readers know my go to tips are the JVC Spiral Dots, and whilst I did try them out and enjoyed the added treble reach and slightly larger soundstage, the security of the well fitted stock tips with their solid inner ring ala Spinfits style meant that I would prefer to not have my Spiral Dots fall off and get stuck in ears. The Lear Kaleido is a musical, warm, lush earphone. No drastic V shape here. An understated energetic approach here. Nothing too in your face. I enjoyed the laid back approach the Kaleido has, I found it non fatiguing to listen to for long periods of time. The bass is quite delicious, even slightly colored to an extent, especially the sub bass reaches the lowest and has a nice rumble to it rather than being punchy. The treble is dialed back more than is common and I would not pair this with a warm dap, though neutral daps seem to be becoming more and more the norm these days anyway. Its is natural in its approach and provides enough to give that detail and transparency where needed. The mids are a mix, present enough to give it some body and lend life to vocals yet slightly recessed also. It seems to have more upper mid range to my ears. Width and depth is around average/medium yet there is also a sense of spaciousness within. I didn`t try the foams, they come in straight medium length, and short and rounded. The Black tips give a bit more body and treble extension. The clear tips a bit more warmer. The LEAR Kaleido is a great IEM. Suitable for mini audiophiles, high enders who want a chilled vibe session and also the more profane mobile phone users. Easy to drive, nary a hiss and a satisfying black background. I found the fit easy, light and comfortable. JVC Spiral Dots are my usual go to tips for fit and preferred sound signature, I found the stock tips comfortable and well fitting, I ended up using the black silicone the most. The Kaleido leans towards the warm side of things, its very forgiving, smooth and velvety. Dap matchability is a must, I enjoyed it with Opus#2 (most recent firmware) , iBasso DX200 with amps 1 & 4 (with ALO Audio cable and iBasso adapter) and the Hidizs AP80 for instance. Daps aside I tried it also with my ipod Touch 6G (using Flacplayer app by Dan Leehr), whilst it performed well with dedicated daps I could detect less resolution, graininess and a more compressed sound stage on various tracks when used with the ipod touch 6G. Perhaps some of the more recent phones with their high end dacs might be more of a pleasing experience and combination. The LEAR Kaleido has more of a chance to shine when combined with a decent dap. In closing the LEAR Kaleido is an earphone that can be pleasing for many a casual user I would expect. There is nothing terribly offensive about the sound, no sibilance or screeching highs, no flabby or overpowering bass, enough mids to give the vocals that swing but without entering into muddiness. It is an earphone that is lovely to look at, small enough to fit most ears well, has an engaging sound which is coherent and performs great when paired with a decent source. "You can go into Mark Twain's material and prove anything you want. He was against war. He was for war. He was against rich people and he was for them. He was a kaleidoscope."